Une très belle ambience à la messe, plein d’émotion. Vous êtes si nombreux (27) le jour de Noël , je peux imaginer votre joie avoir la famille tout autour de vous. Oui Stéphanie nous avpns passsé un bon noël . Où avez-vous passé Noël .? Beautiful video! The last song, “Il est ne” Is one we sang in Africa. I was pleased when my grand-daughter’s high school choir sang it in their Christmas concert. They have a very good choir director who often has them sing songs in languages other than English. My grand-daughter is 17, and has one more year of high school left. She wants to become a nurse like her mother. It’s wonderful that your family was with you. I look forward to the rest of your post. Praying that God will continue to bless you in the New Year. What a beautiful video Michel! I hope you all had a wonderful and blessed Christmas. God bless. Thank you ,Nico, yes we had a great Christmas . I am glad you love the video. The table setting is beautiful, Michel. We will come back later to see the rest of your post! The video isn’t working for me with my browser, but it sounds like it is lovely. Sorry the video does not work with your browser, Lavinia. This happens from time to time with various sites. Thank you for your good wishes,Lavinia . I do not know if this post was finished when you came . .Anyway thanks for your kind words . BTW how many Christmas meals have you got ? This is to much to bear on your shoulders. The two I did were work but the other two are pretty easy. I have always wanted to visit that cathedral. Your video gives me a taste of its magnificence! Michel, my sincere congratulations to you and Janine on your family. You have given them a wonderful heritage of faith, family, and fellowship. You have accomplished something truly great here! Merry Christmas and Happy New Year to you all! God bless and keep each one of you in 2019. Caroline it is not the cathedral of Amiens that is a lot larger and higher , this is the main church of one of the quarters of Amiens Thank you for your kind and encouraging words. I hope you got a great Christmas and I wish you a happy new year. Mozart was such qa vulgqr rascal, it sometimes is had to imagine he also composed some of the most stunning and beautiful music used in the church. “Ave verum corpus” is a prime exampler of his genius, eh?! What a beautiful and memorable Chridtmas you and Janine had this year! Thank you for sharing it, Michel! I had to look up “minuit chrétien”, which is familiar to me as “Oh holy night”. I can appreciate you running out of steam on that song! There are some really challenging parts. I’d have to sit down and get my breath to sing some parts! About “Minuit Chrétiens ” some of my children have recorded but the beginning was missing . I prefered not to post.! This is a song that goes from the low tunes to the hight and it is rather tiring. Michel, la seule façon pour moi de chanter cette chanson serait à l’église, où tous les autres congrégants seraient “couverts” pour mes faibles compétences en chant! Ha! Je le laisse aux professionnels et aux personnes qui le chantent de tout cœur. Dieu sait qui ressent le message et leur pardonne leurs notes manquantes. Je soupçonne que le gars dans la vidéo aurait juste assez d’entrain et de volume pour couvrir les notes manquées pour une église fulol! Unfortunately, this song is no longer sung in our church for some words that are not in accord with theology since the 1962 Council. But I remember that after the war, this song was sung in all the churches in midnight in France. What a pretty table, and a wonderful gathering! May all the best continue for you all as the year draws to a close! Thank you ,Neil, for your wishes . May the things be like you say. thank you . and I wish a happy year to you . Bon bout d’an à toi, Michel. 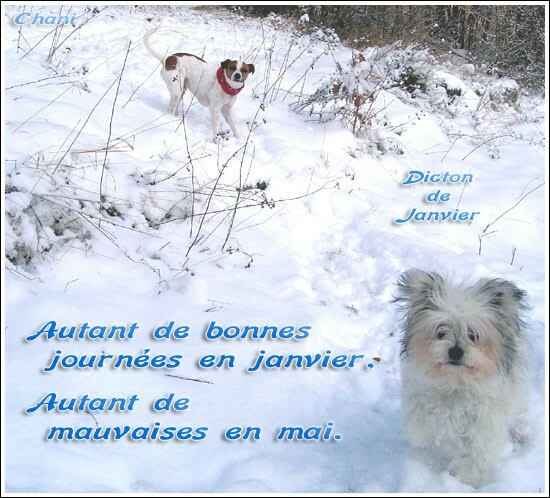 Je te souhaite une bonne année pour ta santé , ton travail et ta famille,Gilles. Merci beaucoup, Michel ! Je prend tout … sauf le travail que j’ai quitté en novembre. What a wonderful Christmas, Michel! Wishing all of you a healthy happy 2019! Absolutely beautiful family photos, Michel! ❤ What a big, happy family you have. The bond you share is really wonderful! 🙂 A very happy, healthy 2019 to all of you!! Thank you Marion .I am glad my post pleases you. My dear friend, you are very fortunate to have everyone join you for Christmas. It is difficult to do here with everyone’s schedules. I am happy for you! The video shows a love for your church family. Very nice! For us, I was thankful for clear roads. No snowstorms, or ice, to worry about. Also thankful for Misha’s 1st Christmas. i regret it is impossible for you to gather all of your daughters. But celebrate the first Christmas of Misha is a consolation. I wish you Rachel and your family a happy year 2019. Merci pour les photos et la vidéo Papa ! C’était en effet un Noël joyeux et chaleureux ! It looks like a wonderful and very merry Christmas, indeed! Beautiful family and photos Michel. Thank you for sharing another Christmas with us. Yes we had a great time ,Christine .But I know this makes you think of your son . This is hard to endure in those feast times . Wonderful ! Thank you for sharing your family. A family that large without shadow is truly a blessing. I agree fully with you,Gail. Michel, it sounds like the entire family had a perfect Christmas, with the church service, the feast, the games and the gifts! How wonderful to be surrounded by 28 loved ones! Love the pictures and the video. Best wishes to all in the new year! I am so glad you enjoyed such a lovely Christmas 🙂 The video makes one realize – we are all the same all the world over ❤ Janine's reaction to her gift – so often we are surprised by how our heart can still grow over precious things/times/people. May we all be so lucky when that happens. May we all be so lucky to have that happen to us. It certainly looks beyond marvelous, a beautiful family gathering, unforgettable. It looks like you and your family had a lovely Christmas! To me, the best gift of all was having everybody together. Family time is very precious! The gifts, music, and games make it fun, but family makes it special. Your home and your table were beautiful and it looks like Janine and your daughters worked very hard to make a beautiful scene and a scrumptious meal! Our family was all here for Christmas Eve. We opened gifts, went to Mass, and then came back and had dinner. It was a lovely day at our house, too! I have not been able to spend very much time on facebook recently. Over the next few days, I hope to read your posts that I have missed. Happy 2019 and love to you, Janine, and your whole family! Thank you , Nancy for your kindness .I enjoy too you got a great christmas together ,in family. Thank you, Michel! You are a great gentleman! Grabbed the link off FB Michel. So glad you have a close family to share holiday’s. What a beautiful and awesome Christmas. You have such a beautiful family. Thank you Elizabeth and happy New year to you. Thank you Rhonda and happy New Year to you. Merry Christmas and a very Happy New Year to You, Janine, and the rest of your beautiful Family. Than you Yvonne I sent you a card . Thanks , Suzy ans a very happy years for you and yours. Yes facebook is a link with all the family members. Bonne année, Michel! Peace to you and Janine! Lovely photos of the whole family! Very happy and joyous. May there be more blessings. Happy New Year to you Angy! Looks like a wonderful celebration of Christmas! Happy New Year!! Une très belle journée et des souvenirs à cherir jusqu’à Noël prochain! Tous des rois et des reines !! Bonne année nouvelle à toute la famille Fauquet ! Merci Anne-Marie et bonne année pour toi. Oh, Michel, it sounds marvellous! Great photos, too. I wish you all a healthy and rewarding new year! Thank you Cynthia . I have just posted another entry in thinking of you. Just stopped by to say “Hey!” and leave some ❤ and prayers for you and Janine! I can’t believe how fast, too fast, the time has gone. The twins are already so big and Manon and Antoine are almost grown up! I feel like I know your whole family, Michel, and it is my pleasure to continue to read and see you and your lovely family.